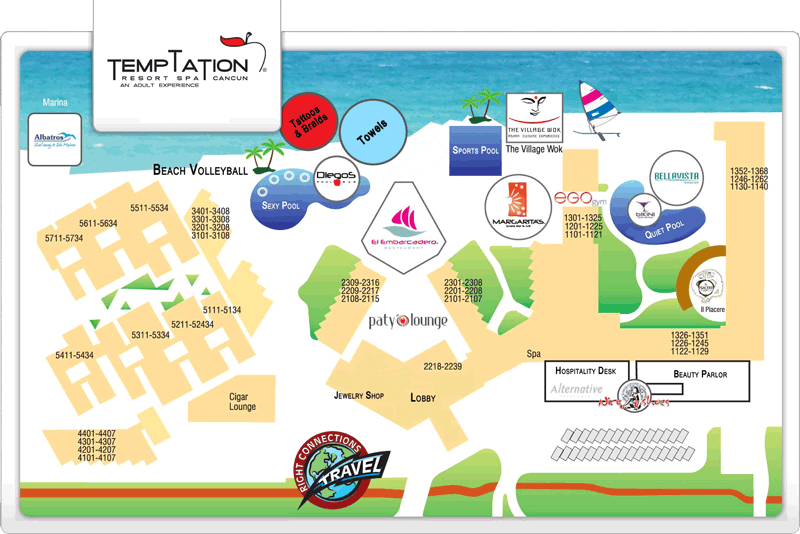 Temptation Resort Spa offers 384 accommodations in three categories- Deluxe rooms, Jacuzzi Suites and Temptation Suites - all featuring exquisite, stylish, modern décor and private terraces or balconies boasting spectacular ocean or garden views. 342 Deluxe Rooms offer accommodating options between one king bed or two double beds, each with a garden or an ocean view. They have highlighted décor with white, red and silver accents along with luxurious furnishing such as duvets, black outs curtains, drapes and full length mirrored sliding closet doors. Room amenities include: flat screen TV; individually-controlled air conditioning; direct-dial telephone; vanity mirrors; coffee maker; hair dryer; iron and ironing board; mini bar (soft drinks, water, juices and beer - stocked daily); safety deposit boxes; electronic door locks. 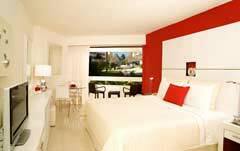 30 Jacuzzi Suites offer one king size bed, a terrace with a pool view and an outdoor jacuzzi. Every room includes a pull down privacy screen, modern décor that is highlighted with white, red and silver accents, artwork, luxurious furnishing and full length sliding closet doors with mirrors. Bathrooms are equipped with fixtures, makeup and vanity mirrors, decorated with pearlescent red glass tiles, ceiling and a high rain showerhead. Room amenities entail: screen TV; iPod dock, individually-controlled air conditioning, direct-dial telephone, coffee maker, hair dryer; iron with ironing board, mini bar (soft drinks, juices and beer - stocked daily); safety deposit boxes and electronic door locks. 12 Temptation Suites feature one king size bed, a giant terrace with two modern lounge chairs from which an enchanting view of the bay can be appreciated. 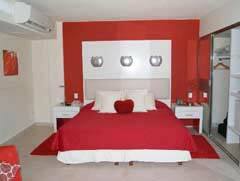 With stylish décor, they are highlighted with white, red and silver accents as well as artwork and convenient details such as pull down privacy screen, luxurious furnishing and full length sliding closet doors with mirrors. 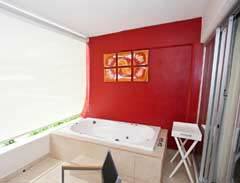 The bathrooms are equipped with a Jacuzzi for two, fixtures, makeup and vanity mirrors, decorated with pearlescent red glass tiles, ceiling and a high rain showerhead. Other amenities are screen TV; iPod dock, individually-controlled air conditioning, direct-dial telephone, coffee maker, hair dryer; iron with ironing board, mini bar (soft drinks, juices and beer - stocked daily); safety deposit boxes and electronic door locks.